The markets are flat to up modestly this morning as we digest yesterday’s sell-off. Is this the level were value buyers are attracted to the market and that is who is supporting us here? Or are we being propped up by swing traders foolishly trying to pick a bottom? One group has a lot of weight and conviction behind them and the other is a 90lb weakling that will bail at the first sign of trouble, so it really does matter who is buying at these levels. The one slight positive is we no longer seem to be triggering an avalanche of selling at each weak patch we encounter. Yesterday we sliced through the 50dma and found a bottom early in the trading day and climbed from there. But the other side of the coin, if we are not seeing panic induced selling by weak-kneed traders, then what we are seeing is real selling by institutions, and that is a lot more meaningful. The market moving earnings release will come from AAPL after the close. 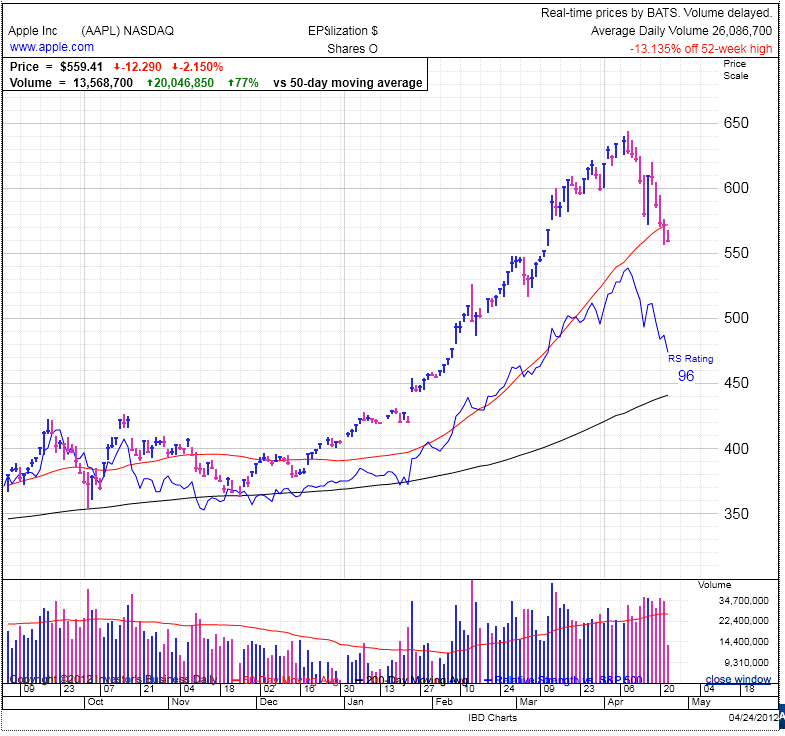 AAPL was the general that lead the Q1 rally and it also represents ~12% of the NASDAQ index. Any weakness in AAPL will surely affect the tech trade, if not the entire market. But on the other side, a strong result from AAPL could kick off the next bull leg higher. Given AAPL’s 50% price gain over the last few months, it really is hard not to think AAPL shares are priced for perfection and the bar is set extremely high for them. And on top of that, virtually every ‘expert’ I’ve seen is saying you should buy the dip on AAPL. When the market gets so one sided on a stock, it inevitably goes the other way because of the supply and demand imbalance. Is AAPL at that point? In a few hours we’ll know the answer.